After this year's election campaign has been marred by numerous reports of outdoor election advertising vandalism concerning several parties, the Democratic Party has now filed a complaint with the police. The vandalism of outdoor election advertising is a much-discussed topic on social media. where many photos are circulating. 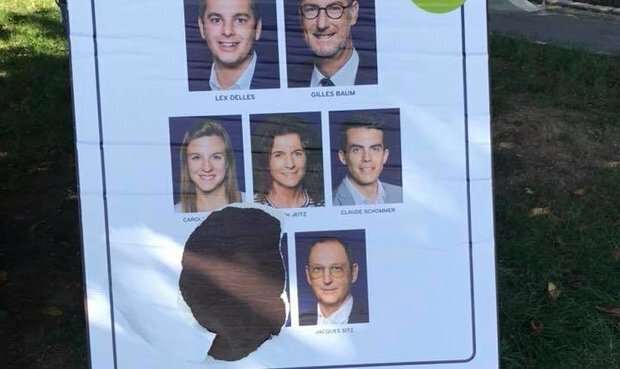 There have been several incidents in the eastern area of Luxembourg where someone has been cutting out the photo of one specific Democratic Party candidate on the outdoor advertising depicting the party's candidates for the area. On Thursday, the vandalism occurred four times on the same panel, despite someone placing a new photo of candidate Monica Semedo each time. The Grevenmacher section of the Democratic Party has now filed a complaint with the police. RTL received this information from the Moselle section of the party. If the police find the vandal in question, they will be charged with some expensive fines. The DP advertisement are not the only ones which have been subject to vandalism. As the party ADR shared on Facebook, their ads have been destroyed or defaced.